Rama Thirunamachandran is the academic lead and chief executive of Canterbury Christ Church University. He joined the University in October 2013, following five years as Deputy Vice-Chancellor and Provost of Keele University with overall responsibility for Keele’s academic activities. At Keele he was also responsible for its strategic and operational leadership for academic planning, budgeting, and delivery of teaching, research and enterprise, with specific responsibility for leading the University’s Internationalisation Strategy. 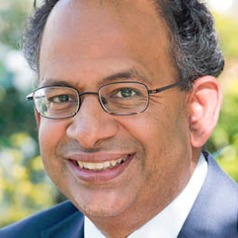 From 2002, Rama Thirunamachandran was Director for Research, Innovation and Skills at the Higher Education Funding Council for England (HEFCE) with overall responsibility for the strategic direction of HEFCE’s research, knowledge transfer, and employer engagement and skills policies, with an annual budgetary responsibility of £1.5 billion. His responsibilities included oversight of the operation of the Research Assessment Exercise and the development of the Research Excellence Framework. He has also held posts at the University of Bristol, King’s College London and Royal Holloway, University of London. Educated at Cambridge University in Geography and Natural Sciences, he worked on a United Nations Development Programme project on the effects of flooding in Bangladesh. His current interests are in higher education and public policy, and he is a Director and Trustee of the Higher Education Academy and is also a Fellow of the Royal Geographical Society.